Another roundup of some of the beers I've had recently. As before, this isn't meant to be a set of tasting notes, more a summary and any note worthy points. 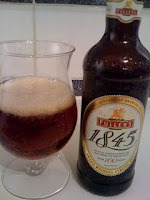 Fuller's 1845. Apparently aged for a minimum of 100 days before sale, the colour is a deep chestnut with hints of red. The aroma is a combination of alcohol and tangy dark, fleshy fruits. 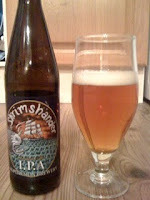 The flavour is a combination of caramel malt and fleshy fruits with some subtle alcohol warmth. A slightly drying, bitter finish powers in but doesn't linger. You can also clearly taste some roasted malt coffee flavours in the background. Very nice. Gadds' Reserved. Picked this one up from Eddie a few weeks back and had been saving it for the festive break. It's a barley wine that's been aged in red wine casks. The colour is a lovely deep red with no head at all. This bottle had a slight haze but that could've been down to it being a little too cold. The smell is some subtle red wine accompanied by horsey, farmy Brett. The taste has some sweetness up front, moving to slight fruitiness then finishing with slight bitterness and big drying Brett. The Brett in the taste is also farmy and horsey but adds an elastic/rubber element that reminds of plasters. I wonder if the brewer was intending this to taste the way it does, I was expecting some more winey notes but this is excellent none the less. 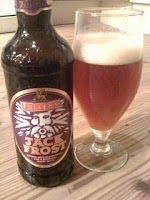 Fuller's Jack Frost. Described by the brewer as a winter beer, blackberries are used in its production. The colour is a deep flame with purple hues, the head is big, fluffy and white. Aroma wise you get spicy hops and jammy fruit. The taste is quite thin and watery with a crisp but not overly bitter finish. Very good, but not characteristics I would expect from a winter beer. There's some sweetness present and some fruitiness too, I couldn't help but be disappointed by the lack of pronounced blackberry flavour though. I can see myself drinking this on hot summer days and really enjoying it. Hopdaemon Skrimshander. A gorgeous flame colour, looking at the photo of this beer just makes me thirsty. The nose is overtaken by masses of fruity, piney, resinous hops. The taste is light and refreshing with the promise of resinous, piney hops being kept, leading to a crisply refreshing bitter finish. Delicious. Ooh Skrimshander, one of my favourites. The Hopdaemon brewery used to be round the corner, now it's 10 miles down the road, must pay them a visit. If you're near Whitstable, Chunk, get in touch; I've got quite a few brews ready to drink. I'm living in London now but originally from Kent. Still travel down there a bit to see the family and stuff. Would be cool to set up a beer exchange by post though ... homebrew I mean. I missed the first beer swap, so I'm not sure how much postage cost and who ended being the cheapest service. If you're interested, I'll investigate! I cover most of London in my job and my son lives in Woolwich so can probably swap beer in glass if that's more convenient. Cool. Might be difficult in the short term because I'm pretty busy in Jan and off on holiday (Ski trip). Let's do it after that. You aren't, per chance, planning on going to the Dover Winter Beer Festival are you? I'm hoping to be there, so maybe that's an option. On this subject, a full blown homebrewers beer swap would be awesome. I'd be up for a homebrewed beerswap! I'll be at Dover along with others. Sounds good, what day are you going? I'll talk nicely to my dearly beloved and see if she'll drive me and my bottles. Would have to be the Saturday for me. I've got a few beers I'll bring. Couple of ESB's a basic stout and something a bit different. 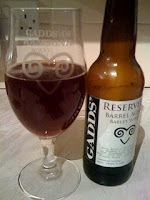 Ah that Eddie Gadd is a good brewer. I love the Reserved, think it's fantastic. I also get through quite a bit of Skrim, although Pete needs to give me a few more bottles, I think! And if anyone wants to send me homebrew then I'll drink it! I'm really interested in homebrew and how it has created the current beer scene in the US. I keep wondering if the same base of homebrewers will 'turn pro' in the UK and go the same route. Eddie is the man. I've got a bottle of No 3 and a bottle of Black Pearl waiting for me tomorow.